Over the last 30 years, I have received hundreds of phone calls from landowners requesting Florida bass or tiger bass to be added to their lakes in order to increase the average size of bass caught. Most of these callers feel that by changing the genetics, the size will improve. Although the genetic growth potential of the tiger bass has been well documented, the most important key to rapid and sustained growth of bass is the establishment of an abundance of proper size forage or food fish. These bass range from 2.0 to 3.1 pounds and are less than one year old. A 30:1 bluegill to bass stocking ratio produced this rapid growth. For more than 60 years, state game and fish agencies and university extension staff have recommended a 10:1 stocking ratio of either 500 bluegill fingerlings and 50 bass fingerlings or 1,000 bluegills and 100 bass fingerlings per acre in new or renovated ponds. These agencies are still recommending a “one-size-fits-all” program for new ponds, regardless of the type of fishing you desire. The 10:1 pond stocking ratio of bluegill to bass was developed in the late 1940s by Dr. Homer Swingle and his staff at Auburn University. The goal in developing the original stocking ratio was to achieve a reproducing, self-sustaining population of bass and bluegill that rural pond owners could use as an additional source of protein and also provide some recreational fishing. /your-obsession/fishing Typical bass growth was about 10 to 12 inches within one year. Bluegill growth was about 6 to 7 inches or about 1/4 pound the first year. With few exceptions, these ponds stocked with the traditional 10:1 ratio resulted in bass crowded or bass stunted populations within the first two to three years following bass stocking. Bluegill in well-managed ponds will obtain a biomass, or total standing crop, of approximately 300 pounds per acre. Largemouth bass typically require 8 pounds of live forage per year to grow one pound. 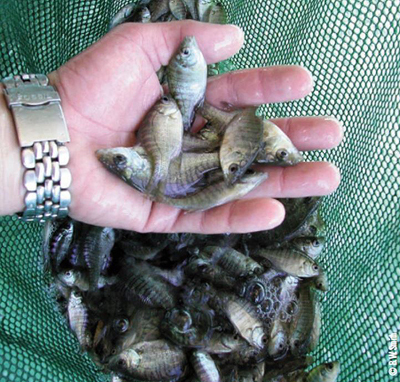 Bass stocked at a ratio of one bass fingerling to 10 bluegill result in growth of .75 to 1 pound for the first year and less than a pound per year for subsequent years. Although the bluegill standing crop may be 300 pounds per acre, most of that weight is represented by adult bluegill too large for the bass to eat. If you are interested in developing a bass fishing lake that produces catches of fat 3- to 6-pound bass with an occasional 8- to 10-pound fish, then you will need to consider an alternative stocking program that will produce plenty of proper-size forage for excellent bass growth. Our experience at American Sport Fish indicates that a bluegill to bass stocking ration of 30:1 creates an abundance of bluegill forage and promotes rapid and sustained growth of bass for several years. A heavy forage base also helps to reduce bass reproduction and survival. Contrary to what most lake owners believe, it takes only a few surviving bass fingerlings each year to maintain a good bass population. For lake owners who are primarily interested in bass fishing, we recommend stocking 1,500 bluegill in the fall or winter followed by 50 tiger bass fingerlings in June. If a feeder is added to the pond in the spring, then big bluegill will be produced as well as trophy bass. We also encourage the stocking of 1,000 fathead minnows per acre and 1,000 golden shiners per acre along with the bluegill. Threadfin shad are recommended for stocking the following spring or early summer. Fathead minnows will boost the growth of the fingerling bass the first year. They spawn at cooler temperatures than the bluegill and will provide food for the bass until the bluegill have spawned. In most ponds, the fatheads will disappear by fall, as the bass eat all of the reproduction and adults. We do not recommend adding more fatheads because the adults will be eaten before they can spawn. Golden shiners are a good forage to stock in new ponds. They will provide food for fingerling bass and adults. Shiners are egg eaters and at high densities will help discourage excessive bass spawning. 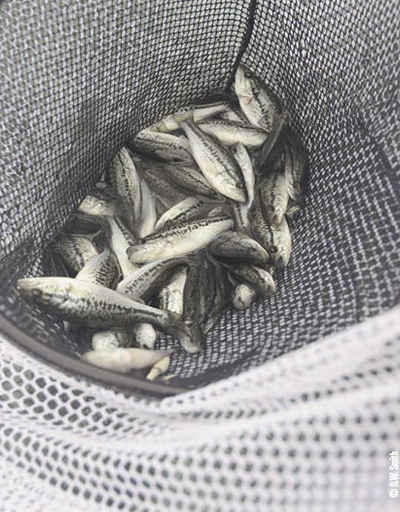 Threadfin shad have proven to be a very important supplemental forage species for accelerated bass growth in both new and established ponds. Threadfin are often stocked in the spring or early summer and will build up enough numbers and biomass to add to the bass food supply by fall. In new ponds, threadfin can be stocked in the spring before the bass arrive or during the summer. With few exceptions, most of the lakes that have excellent bass fishing will have a good population of threadfin shad. Although threadfin do not get large, they are open-water, schooling fish and bass are able to eat several shad in one strike. 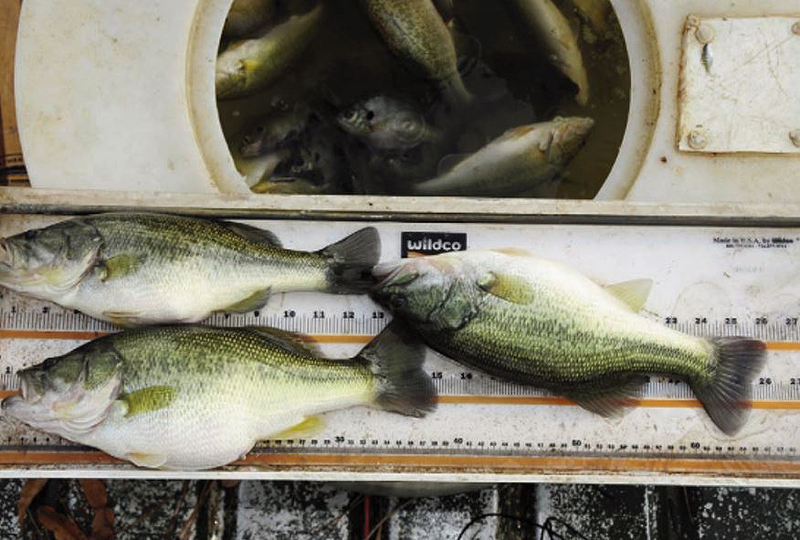 bass growth in well-managed lakes and ponds. We have documented growth rates of the tiger bass as much as 2 to 4 pounds per year. Most pond owners do not achieve these type of growth rates because of inadequate numbers of the proper size forage. In most lakes, bass growth is usually restricted by the amount of forage available. Managing for large numbers of proper-size forage is the most important factor in developing and sustaining bass growth. Bear Lake in Washington County, Alabama was stocked at a 30:1 ratio of bluegill to bass along with threadfin shad. Spencer Ross, a member who fishes the lake regularly, has caught over 50 bass that were greater than 10 pounds and there have been several bass over 14 pounds caught. Ross also caught one bass that weighed 3.5 pounds seven months after it was stocked as a 2-inch fingerling. If you have a new lake you want to develop into a great bass fishery, switch your pond or lake stocking strategy to a 30:1 ratio of bluegill to bass. The longtime rewards are well worth the initial investment.